Since it's Canadian discovery in 2002 (and now available for the first time), Regal Petticoat Maple has garned much attention in the horticultural industry due to its hardiness, soil adaptability, disease and pest resistance and salt and drought tolerance. 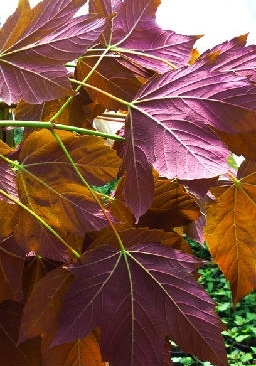 It offers superior leaf colouration in spring, summer foliage that is dark glossy green with a deep velvety purple underside, and an incredible fall colour show : leaves turning aspen yellow on top and bright magenta pink on the underside accented with with reds, oranges, and salmons. It grows to 40 ft. tall by 30 feet wide. * Available by special order. 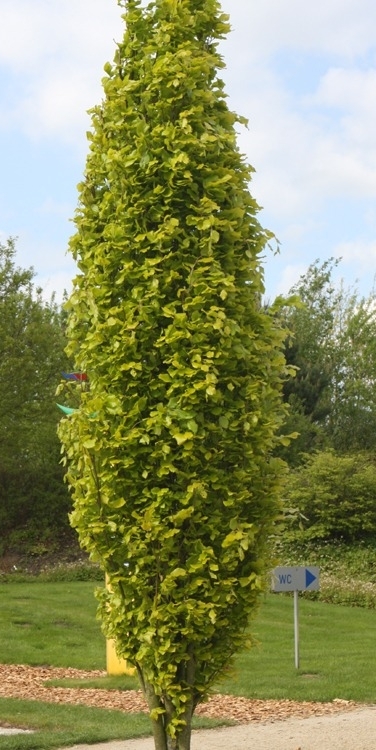 Dawyck Gold Pyramidal Beech has attractive lime green foliage which emerges bright gold in spring. A dense narrow upright columnar tree, the serrated pointy leaves turn a strong coppery-bronze in the fall, and it's smooth silver bark contributes to its winter interest. It will grow at a moderate to slow pace to be about 45 feet tall at maturity, with a spread of roughly 15 feet. This pretty tree is noted for its non-fading yellow flowers, compact pyramidal form and hardiness to both heat and cold. It typically grows as an upright, pyramidal tree to 18-20’ tall with a single trunk althought it can sometimes be found as a multi-stemmed shrub. The upright, tulip-like, yellow flowers are 4" to 5” across and bloom in early spring. 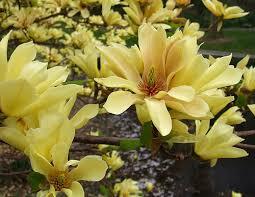 Best if it is planted in the sun on well-drained soils. ** Available by special order. The larger growing brother to the popular Weeping Mulberry, this fast growing tree has glossy deep green leaves (famous as the food for silkworms) and flavourful dark red fruit in late summer. It grows to 50 feet tall by 35 feet wide in all soil conditions. **Not currently available. 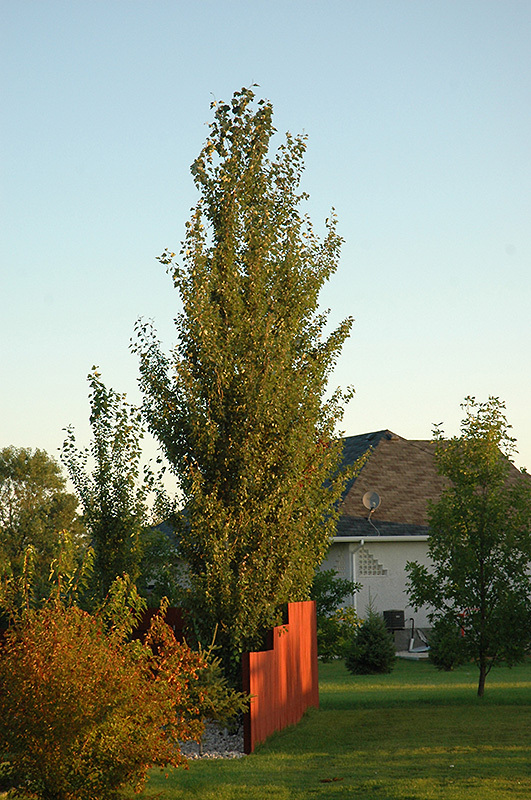 Tower Poplar is a fast growing, tall columnar tree that closely resembles the Swedish Columnar Aspen. It produces no fluff, requires minimal maintenance and no pruning. It can tolerate drought and thrives in poor soils. Tower Poplar is most commonly planted in shelterbelts and as a privacy or shade tree on larger sites as it grows to 50 feet tall by 10 feet tall. ** Available by special order. 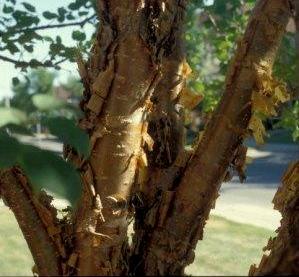 This rare tree is related to Japanese tree lilac, but is marked by its distinctive orangey to copper coloured peeling bark which gives it a unique 'birchy' look. 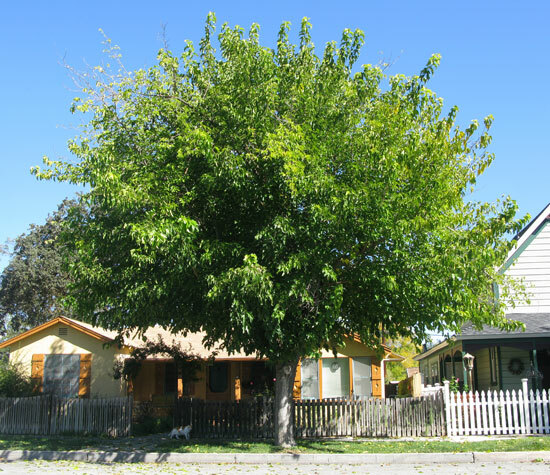 A durable and pest resistant tree with white fragrant flowers in late June, it grows to about 25 feet tall by 18 to 20 feet wide in sun or light shade. ** Available by special order. Fragrant lilac purple and white bi-coloured blossoms mark this stunning single stemmed lilac tree. A perfect hardy small tree or garden accent that could grow to 10' tall, the flowers are densely held and bloom in June. 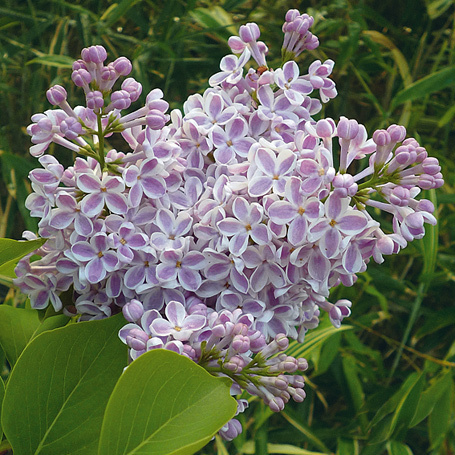 Lilac trees grow best on well drained soils and bloom best with the most sun exposure possible.